The Jade Buddha Monastery is located in Anyuanlu street in western Shanghai. 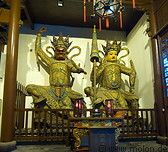 Built in 1918 it hosts two wellknown, valuable jade buddha statues. The monastery is still inhabited by monks.